A surge of cold, Arctic air greeted visitors to Door County in early January as 2015 made its entrance. Despite temperatures that dipped to more 10 degrees below zero and wind chill factors approaching 40-below, local merchants welcomed residents and visitors alike with a warm smile. Thanks to last year’s lengthy visit from the Polar Vortex, Door County residents are used to these temperatures and simply shrugged off the latest cold spell. In fact, the bright white of freshly fallen snow was a welcome change from the brown landscape that colored our warm Christmas season. 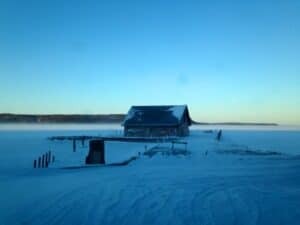 Take the opportunity to enjoy nature’s winter beauty by taking a drive to Door County this time of year. The traffic is light, and seeing your favorite landmarks bathed in ice and snow is a visual treat. We enjoy all four seasons in Door County and invite you to experience them, too. The reservation book is open for the 2015 season at Ephraim Shores, one of the premier motels in Door County, Wisconsin. Call us at (920) 854-2371 or access our online reservation system at http://ephraimshores.com/. Opening day at Ephraim Shores is Friday, May 1, with room rates only $80 per night that weekend. Make sure to book your room at Ephraim Shores early for the Door County Half Marathon and Nicolet Bay 5K runs, scheduled for Saturday, May 2. This is a very popular weekend in Door County, and we would be honored if you chose to stay with us. Ephraim Shores offers one of the most convenient locations of any motel in Door County to take in the first big race of the season.